Are loops really faster in reverse? I'm assuming it's because the loop no longer has to evaluate a property each time it checks to see if it's finished and it just checks against the final numeric value. // count is only evaluated once and then the comparison is always on 0. It's not that i-- is faster than i++. Actually, they're both equally fast. you evaluate .length each time you increment i, when you check if i <= array.length. In most cases you shouldn't even worry about this kind of optimization. I try to give a broad picture with this answer. [[In terms of low level languages like C/C++, the code is compiled so that the processor has a special conditional jump command when a variable is zero (or non-zero). but the reasons for this can be quite complicated (just to mention, there are the issues of processor command preprocessing and cache handling in the game). It is also less error-prone and browsers have a chance to optimize your code. Moreover, also for low level languages, the best practice is to use some smart library function for complex, looped operations if it is possible. Those libraries can also put things (multi-threaded) behind your back and also specialized programmers keep them up-to-date. The recommendation is to NOT evaluate the size of the array each time. For big arrays one can see the performance degradation. A more recent benchmark created by Milan Adamovsky can be performed in run-time here for different browsers. It's not the -- or ++, it is the compare operation. With -- you can use a compare with 0, while with ++ you need to compare it with the length. On the processor, compare with zero is normally available, while compare with a finite integer requires a subtraction. So it takes longer on the processor when compiled. 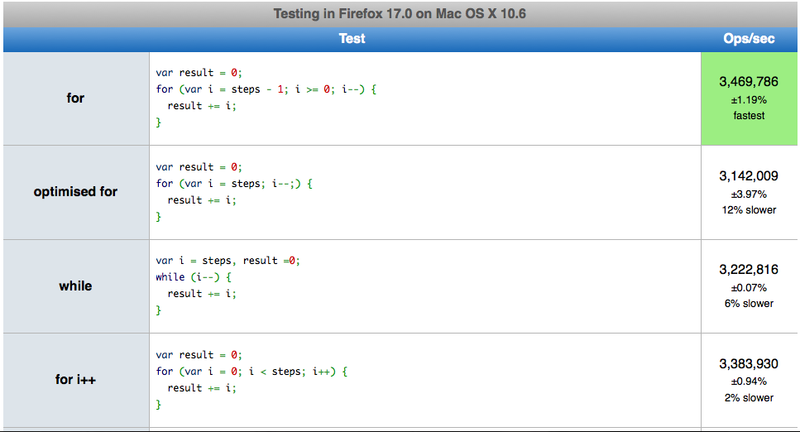 The performance criteria is the use in the for loop and the compare statement. A performance difference may occur in a loop. The background is that on the assembler code level you can see that a compare with 0 is just one statement which doesn't need an additional register. This compare is issued on every pass of the loop and may result in a measurable performance improvement. Note that 0 is a literal, or in other words, a constant value. Note that end is a variable which needs a CPU register. This may invoke an additional register swapping in the code and needs a more expensive compare statement in the if statement. For a high level language, readability, which facilitates maintainability, is more important as a minor performance improvement. Normally the classic iteration from array start to end is better. The quicker iteration from array end to start results in the possibly unwanted reversed sequence. As asked in a comment: The difference of --i and i-- is in the evaluation of i before or after the decrementing. The best explanation is to try it out ;-) Here is a Bash example. % i=10; echo "$((--i)) --> $i"
% i=10; echo "$((i--)) --> $i"
I've seen the same recommendation in Sublime Text 2. But if you ask me, the whole point is not about the i++ vs i-- optimization, but about not having to evaluate the length of the array at each iteration (you can see a benchmark test on jsperf). Secondly, provided that simplest constructs JIT'ed and translated to native instructions, then i++ vs i-- will totally depend on the CPU that executes it. That is, on ARMs (mobile phones) it's faster to go down to 0 since decrement and compare to zero are executed in a single instruction. --i and i-- are the same in Firefox while i-- is faster in Chrome. In Chrome a basic for loop (for (var i = 0; i < arr.length; i++)) is faster than i-- and --i while in Firefox it's slower. In Both Chrome and Firefox a cached arr.length is significantly faster with Chrome ahead by about 170,000 ops/sec. Without a significant difference, ++i is faster than i++ in most browsers, AFAIK, it's never the other way around in any browser. Shorter summary: arr.pop() is the fastest loop by far; for the specifically mentioned loops, i-- is the fastest loop. It depends on placement of your array in memory and the hit ratio of memory pages while you are accessing that array. In some cases accessing array members in column order is faster than row order because of the increase in hit ratio. The last time I bothered about it was when writing 6502 assembly (8-bit, yeah!). The big gain is that most arithmetic operations (especially decrements) updated a set of flags, one of them was Z, the 'reached zero' indicator. So, at the end of the loop you just did two instructions: DEC (decrement) and JNZ (jump if not zero), no comparison needed! So as far as you can see, there is no difference between performance in any environment. But you have to understand that the improvement you can gain will be so insignificant, that mostly you should not even care about it. A long, long time ago there was a common machine instruction, DSZ (Decrement and Skip on Zero). People who programmed in assembly language used this instruction to implement loops in order to save a register. Now this ancient facts are obsolete, and I am pretty sure you will not get any performance improvement in any language using this pseudo improvement. This is not dependent on the -- or ++ sign, but it depends on conditions you apply in the loop. For example: Your loop is faster if the variable has a static value than if your loop check conditions every time, like the length of an array or other conditions. But don't worry about this optimization, because this time its effect is measured in nanoseconds. for(var i = array.length; i--; ) is not much faster. But when you replace array.length with super_puper_function(), that may be significantly faster (since it's called in every iteration). That's the difference. If you are going to change it in 2014, you don't need to think about optimization. If you are going to change it with "Search & Replace", you don't need to think about optimization. If you have no time, you don't need to think about optimization. But now, you've got time to think about it. P.S. : i-- is not faster than i++. I made a comparison on jsbench. the comparison is implicit, it happens just before decrementing i, and the code is very readable. However, what can make a terrific difference, is what you put inside the loop. If you can inline your code, instead of calling a function, without sacrificing legibility, you can have a loop an order of magnitude faster! Code is written for people to read, and only incidentally for machines to execute. The way you're doing it now isn't faster (apart from it being an indefinite loop, I guess you meant to do i--. The problem with this is that evaluating the length of the array using myArray.length takes time and the way that we have coded the loop means that this evaluation has to be performed every time around the loop. If the array contains 1000 elements then the length of the array will be evaluated 1001 times. If we were looking at radio buttons and had myForm.myButtons.length then it will take even longer to evaluate since the appropriate group of buttons within the specified form must first be located before the length can be evaluated each time around the loop. What we can do to correct this for a loop where the size is fixed is to evaluate the length once at the start of the loop and save it in a variable. We can then test the variable to decide when to terminate the loop. This is much faster than evaluating the array length each time particularly when the array contains more than just a few entries or is part of the web page. So now we only evaluate the size of the array once and test our loop counter against the variable that holds that value each time around the loop. This extra variable can be accessed much faster than evaluating the size of the array and so our code will run much faster than before. We just have one extra variable in our script. Often it doesn't matter what order we process the array in as long as all of the entries in the array get processed. Where this is the case we can make our code slightly faster by doing away with the extra variable that we just added and processing the array in reverse order. This code still only evaluates the size of the array once at the start but instead of comparing the loop counter with a variable we compare it with a constant. Since a constant is even more effective to access than a variable and since we have one fewer assignment statement than before our third version of the code is now slightly more efficient than the second version and vastly more efficient than the first. In many cases, this has essentially nothing to do with the fact that processors can compare to zero faster than other comparisons. Bear in mind that with simple tasks like adding/subtracting one from a variable, or comparing a variable to something, the overhead of the interpreter moving from one internal "instruction" to the next is quite high, so the less "instructions" that are used internally by the JS engine, the better. In low-level assembly, there is a looping instruction, called DJNZ (decrement and jump if non-zero). So the decrement and jump is all in one instruction, making it possibly ever-so-slightly faster than INC and JL / JB (increment, jump if less than / jump if below). Also, comparing against zero is simpler than comparing against another number. But all that is really marginal and also depends on target architecture (could make difference e.g. on Arm in a smartphone). I wouldn't expect this low-level differences to have so great impact on interpreted languages, I just haven't seen DJNZ among the responses so I thought I would share an interesting thought. It used to be said that --i was faster (in C++) because there is only one result, the decremented value. i-- needs to store the decremented value back to i and also retain the original value as the result (j = i--;). In most compilers this used up two registers rather than one which could cause another variable to have to be written to memory rather than retained as a register variable. I agree with those others that have said it makes no difference these days. "i-- and i++. Actually, they're both takes the same time". but in this case when you have incremental operation.. processor evaluate the .length every time variable is incremented by 1 and in case of decrement.. particularly in this case, it will evaluate .length only once till we get 0. You should write readable code. The following code take much different time. Therefore the following code take different time too. Not a lot of time is consumed by i-- or i++. If you go deep inside the CPU architecture the ++ is more speedy than the --, since the -- operation will do the 2's complement, but it happend inside the hardware so this will make it speedy and no major difference between the ++ and -- also these operations are considered of the least time consumed in the CPU. Initialize the variable once at the start. Check the constraint in the second operand of the loop, <, >, <=, etc. Increment the loop and loop again throw these processes again. will calculate the length at each loop, so it will consume a lot of time. The best approach to answering this sort of question is to actually try it. Set up a loop that counts a million iterations or whatever, and do it both ways. Time both loops, and compare the results. The answer will probably depend on which browser you are using. Some will have different results than others. It's small and insignificant and with 100 million rows in a collection it's measurable. on a down loop you might be saying where i >= 0 and be decrementing i instead. The comparison is quicker. Not the 'direction' of the loop. HELP OTHERS AVOID A HEADACHE --- VOTE THIS UP!!! The most popular answer on this page does not work for Firefox 14 and does not pass the jsLinter. "while" loops need a comparison operator, not an assignment. It does work on chrome, safari, and even ie. But dies in firefox. This is just a guess, but maybe it's because it's easier for the processor to compare something with 0 ( i >= 0 ) instead of with another value ( i < Things.length). Why is i— faster than i++ in loops? Why is using a loop to iterate from start of array to end faster than iterating both start to end and end to start? array.forEach running faster than native iteration? How?